In a world where hoarding wealth is considered the norm, giving money to complete strangers, with no strings attached, seems like a radical idea. Yet, for the hundreds who have taken part in Free Money Day since its humble beginnings in 2011, there is a knowing that greater sharing is needed in this world, now more than ever. 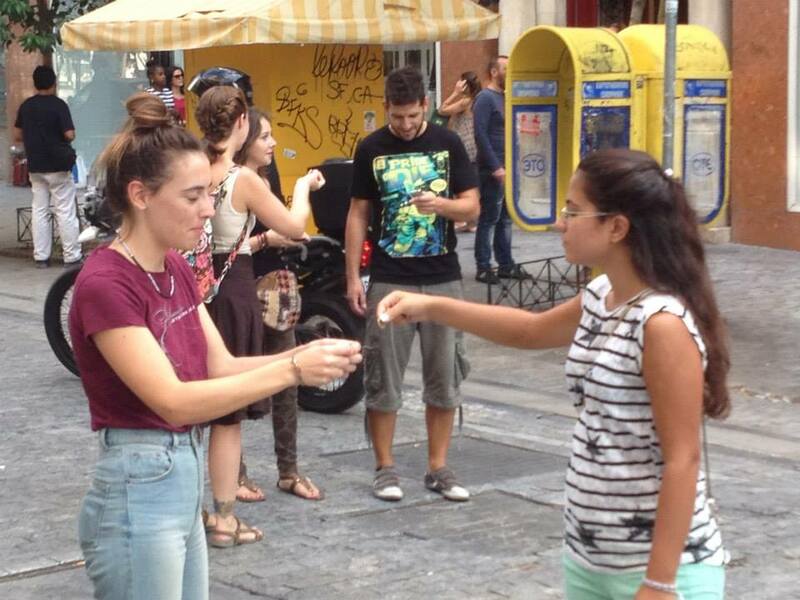 More than this though, our experiences on Free Money Day, each September 15th, confirm that people feel more comfortable giving, than receiving. In 2014, for example, Jennifer Hinton said it took her and three friends over an hour to give away 35 Euros in Athens, Greece. 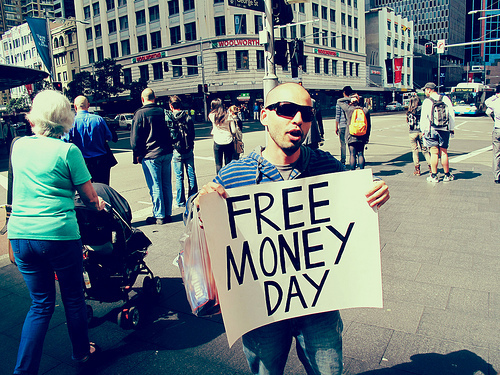 This is where Free Money Day offers such a liberating opportunity; for while the day is certainly a chance for people to push through personal inhibitions about engaging with strangers, it offers an even greater opportunity to expand our ability to receive. In wrestling with the judgments we place on ourselves in relation to money and our worthiness, we more clearly see the pervasive influence of mainstream stories about human nature (if we are essentially greedy and separate from each other, how could we possibly give freely to a complete stranger?). With love and vulnerability at the heart of the Free Money Day exchange, we can continue to collectively heal the rifts that emerge in any scarcity-based culture. But few are willing to jump straight into the vulnerability of receiving from a stranger. 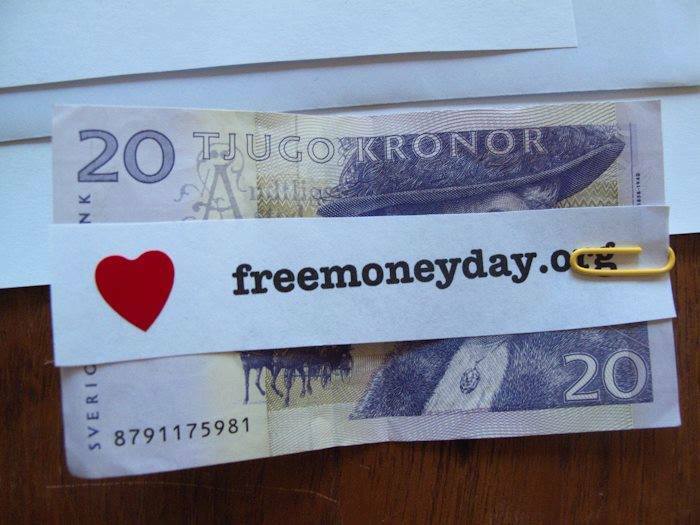 So we encourage Free Money Day participants to use a simple technique (which also serves to spread the experiment): suggest to recipients that they keep half the money you are giving them, and pass the other half on to someone else. This technique massively increases people’s willingness to engage in the experiment, reinforcing that people feel a need to view the giving as legitimate, which in turn legitimises the receiving. In many ways, it is not surprising that people are suspicious, confused, even sometimes offended when they are offered ‘free money’. Mainstream economics still holds that we are driven by rational desires to further our self-interest. This assumption drives a pernicious culture that reinforces its own beliefs by placing on the pinnacle of success those who have been most successful at maximizing their self-interest. So many hear the words ‘free money’ and immediately think ‘greedy scam’. But greed has been absent at every Free Money Day event so far. No one has tried to ‘game’ the experience to make money for themselves. Rather, generosity has been abundant; from people handing out the last few notes in their wallets, to one couple giving away $35,000 of land to whoever arrived next on their organic farm. Where we are most wounded is in receiving the generosity of others. Perhaps part of the reason so many Free Money Day participants have reported unwillingness to receive is because we have a cultural connotation that receiving help, from anyone – especially strangers – is linked with weakness. In this way, as experienced by this man who filmed himself trying to give away money, offering help becomes an insult – an accusation that someone cannot manage by themselves – rather than what it is intended to be – a gesture of love and goodwill. In this light, Jennifer Hinton reported that the most common response she received when she offered people money was “please give it to someone who needs it more than me”. Certainly this response can stem, in part, from generosity for others, and the caring ethic that the Free Money Day experiment hopes to grow. But perhaps there is a part of this response that emanates from a deeper belief: that we are not worthy of love and support, especially not from people who we have never helped. Perhaps it’s a product of the ruthless individualism promoted by neoliberal ideology – where people are expected to succeed by themselves, for themselves. Perhaps centuries of market-based capitalism have ingrained the transaction model so deeply in our psyches that getting something for nothing seems like an impossible trick. And perhaps this is why suggestions to ‘pay it forward’ and learn about the event on the website seems to make people more comfortable with receiving. Excessive taking (greed) is tightly related to materialism, and evidence shows materialism is correlated with personal insecurity. Insecure people feel unable to fully receive the riches they have been given, and when people are supported, loved and feel abundant, they tend to naturally give with immense generosity. 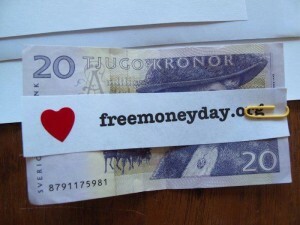 Thus, Free Money Day is an invitation to explore both giving and receiving. In particular, this year, what can you do to encourage people to receive more willingly? Perhaps your smile can break through their cynicism. Perhaps they will feel your heart. And, if so, what a wonderful opportunity for growth because, as the spiritual teacher, Tiziana DellaRovere, says, the expression give and ye shall receive should actually be reversed: receive, and ye shall give. As we increase our capacity to receive love, we are more able to give of it to others in a healthy way. Let us continue to share with others that receiving is not about being weak, nor is it about being greedy. It is about honouring the understanding that we are all worthy of love, responding graciously to the gift of the giver’s desire to give, and replenishing our trust in humanity, so that we can continue to experience the richness of our interconnection on this finite planet. This article was written by Tegan Tallulah and Donnie Maclurcan. Image credits: Nudzejma Avdic, Jennifer Hinton, Amelia Bryne.